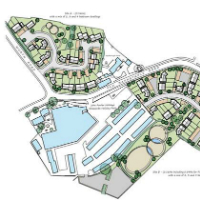 Tetlow King Planning successfully secured planning permission for 80 dwellings at the John Fowler Holiday Park, Ilfracombe. The proposal entails the redevelopment of some outdated chalet buildings which will enable reinvestment in the existing holiday accommodation. The residential development would deliver market and affordable housing including a range of dwelling sizes and public open space across two distinct sites. The planning application was subject to Planning Performance Agreement (PPA) but ultimately it was not controversial and received the support of the community and planning officers. The planning permission was subject to a Section 106 Agreement to secure the delivery of a range of community benefits including affordable housing, open space, school places and highways contributions comprising the provision of a puffin crossing and bus stop.